A tree is a tall plant with a trunk and branches made of wood. Trees can live for many years. The oldest tree ever discovered is approximately 5,000 years old. The four main parts of a tree are the roots, the trunk, the branches, and the leaves. The roots of a tree are usually under the ground. However, this is not always true. The roots of the mangrove tree are often under water. A single tree has many roots. The roots carry nutrients and water from the ground through the trunk and branches to the leaves of the tree. They can also breathe in air. Sometimes, roots are specialized into aerial roots, which can also provide support, as is the case with the banyan tree. The trunk is the main body of the tree. The trunk is covered with bark which protects it from damage. Branches grow from the trunk. They spread out so that the leaves can get more sunlight. The leaves of a tree are green most of the time, but they can come in many colors, shapes and sizes. The leaves take in sunlight and use water and food from the roots to make the tree grow, and to reproduce. Trees and shrubs take in water and carbon dioxide and give out oxygen with sunlight to form sugars. This is the opposite of what animals do in respiration. Plants also do some respiration using oxygen the way animals do. They need oxygen as well as carbon dioxide to live. The parts of a tree are the roots, trunk(s), branches, twigs and leaves. Tree stems are mainly made of support and transport tissues (xylem and phloem). Wood consists of xylem cells, and bark is made of phloem and other tissues external to the vascular cambium. As a tree grows, it may produce growth rings as new wood is laid down around the old wood. In areas with seasonal climate, wood produced at different times of the year may alternate light and dark rings. In temperate climates, and tropical climates with a single wet-dry season alternation, the growth rings are annual, each pair of light and dark rings being one year of growth. In areas with two wet and dry seasons each year, there may be two pairs of light and dark rings each year; and in some (mainly semi-desert regions with irregular rainfall), there may be a new growth ring with each rainfall. In tropical rainforest regions, with constant year-round climate, growth is continuous. Growth rings are not visible and there is no change in the wood texture. In species with annual rings, these rings can be counted to find the age of the tree. This way, wood taken from trees in the past can be dated, because the patterns of ring thickness are very distinctive. This is dendrochronology. Very few tropical trees can be accurately dated in this manner. The roots of a tree are almost always underground, usually in a ball shaped region centered under the trunk, and extending no deeper than the tree is high. Roots can also be above ground, or deep underground. Some roots are short, some are meters long. Roots provide support for the parts above ground, holding the tree upright, and keeping it from falling over in high wind. 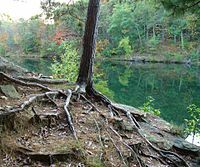 Roots take in water, and nutrients, from the soil. Without help from fungus for better uptake of nutrients, trees would be small or would die. Most trees have a favorite species of fungus that they associate with for this purpose. Above ground, the trunk gives height to the leaf-bearing branches, competing with other plant species for sunlight. In all trees the shape of the branches improves the exposure of the leaves to sunlight. Branches start at the trunk, big and thick, and get progressively smaller the farther they grow from the trunk. Branches themselves split into smaller branches, sometime very many times, until at the end they are quite small. The small ends are called twigs. The leaves of a tree are held by the branches. Leaves are usually held at the ends of the branches. The, although some have leaves along the branches. The main functions of leaves are photosynthesis and gas exchange. A leaf is often flat, so it absorbs the most light, and thin, so that the sunlight can get to the green parts in the cells, which convert sunlight, carbon dioxide from the atmosphere, and water from the roots, into glucose and oxygen. Most of a tree's biomass comes from this process. Most leaves have stomata, which open and close, and regulate carbon dioxide, oxygen, and water vapour exchange with the atmosphere. Trees with leaves all year round are evergreens, and those that shed their leaves are deciduous. Deciduous trees and shrubs generally lose their leaves in autumn as it gets cold. Before this happens, the leaves change colour. The leaves will grow back in spring. The word "tree" in English means a long lived plant having obvious main stem, and growing to a considerable height and size. Thus not all trees have all the organs or parts as mentioned above. For example, most (tree-like) palms are not branched, and tree ferns do not produce bark. There are also more exceptions. Based on their general shape and size, all of these are nonetheless generally regarded as trees. Trees can vary a lot. A plant that is similar to a tree, but generally smaller, and may have multiple trunks, or have branches that arise near the ground, is called a "shrub", or a "bush". Since these are common English words there is no precise differentiation between shrubs and trees. Given their small size, bonsai plants would not technically be "trees", but are indeed "trees". Do not confuse the use of tree for a species of plant, with the size or shape of individual specimens. A spruce seedling does not fit the definition of a tree, but all spruces are trees. 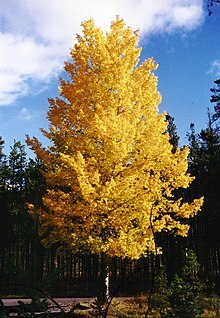 A tree is a plant form that can be found in many different orders and families of plants. Trees show many growth forms, leaf type and shape, bark traits and organs. The tree form has changed separately in classes of plants that are not related, in response to similar problems (for the tree). With about 100,000 types of trees, the number of tree types in the whole world might be one fourth of all living plant types. Most tree species grow in tropical parts of the world and many of these areas have not been surveyed yet by botanists (they study plants), making species difference and ranges not well understood. The earliest trees were tree ferns, horsetails and lycophytes, which grew in forests in the Carboniferous period; tree ferns still survive, but the only surviving horsetails and lycophytes are not of tree form. Later, in the Triassic Period, conifers, ginkgos, cycads and other gymnosperms appeared, and subsequently flowering plants in the Cretaceous period. Most species of trees today are flowering plants (Angiosperms) and conifers. A small group of trees growing together is called a grove or copse, and a landscape covered by a dense growth of trees is called a forest. Several biotopes are defined largely by the trees that inhabit them; examples are rainforest and taiga (see ecozones). A landscape of trees scattered or spaced across grassland (usually grazed or burned over periodically) is called a savanna. A forest of great age is called old growth forest or ancient woodland (in the UK). A very young tree is called a sapling. Scientists in the UK and Malaysia say they have discovered the world's tallest tropical tree measuring more than 100m (328ft) high. A coast redwood: 115.85 metres (380.1 feet), in Redwood National Park, California had been measured as tallest, but may no longer be standing. The tallest trees in Australia are all eucalypts, of which there are more than 700 species. The so-called 'mountain ash'. with a slim, straight trunk, grows to over 300 feet. The stoutest living single-trunk species in diameter is the African baobab: 15.9 m (52 ft), Glencoe baobab (measured near the ground), Limpopo Province, South Africa. This tree split up in November 2009 and now the stoutest baobab could be Sunland Baobab (South Africa) with diameter 10.64 m and circumference of 33.4 m.
Some trees develop multiple trunks (whether from an individual tree or multiple trees) which grow together. The sacred fig is a notable example of this, forming additional 'trunks' by growing adventitious roots down from the branches, which then thicken up when the root reaches the ground to form new trunks; a single sacred fig tree can have hundreds of such trunks. The life-span of trees is determined by growth rings. These can be seen if the tree is cut down or in cores taken from the edge to the center of the tree. Correct determination is only possible for trees which make growth rings, generally those which occur in seasonal climates. Trees in uniform non-seasonal tropical climates are always growing and do not have distinct growth rings. It is also only possible for trees which are solid to the center of the tree; many very old trees become hollow as the dead heartwood decays away. For some of these species, age estimates have been made on the basis of extrapolating current growth rates, but the results are usually little better than guesses or speculation. White proposed a method of estimating the age of large and veteran trees in the United Kingdom by correlation between a tree's stem diameter, growth character and age. Other species suspected of reaching exceptional age include European Yew Taxus baccata (probably over 2,000 years) and western redcedar Thuja plicata. The oldest known European yew is the Llangernyw yew in the Churchyard of Llangernyw village in North Wales which is estimated to be between 4,000 and 5,000 years old. The oldest reported age for an angiosperm tree is 2293 years for the Sri Maha Bodhi sacred fig (Ficus religiosa) planted in 288 BC at Anuradhapura, Sri Lanka; this is said to be the oldest human-planted tree with a known planting date. Studies have shown that trees contribute as much as 27% of the appraised land value in certain markets. assuming 2.2% inflation per year. Tree climbing is an activity where one moves around in the crown of trees. Use of a rope, helmet, and harness are the minimum requirements to ensure the safety of the climber. Other equipment can also be used depending on the experience and skill of the tree climber. Some tree climbers take special hammocks called "Treeboats" and Portaledges with them into the tree canopies where they can enjoy a picnic or nap, or spend the night. Tree climbing is an "on rope" activity that puts together many different tricks and gear originally derived from rock climbing and caving. These techniques are used to climb trees for many purposes, including tree care (arborists), animal rescue, recreation, sport, research, and activism. The three big sources of tree damage are biotic (from living sources), abiotic (from non-living sources) and deforestation (cutting trees down). Biotic sources would include insects which might bore into the tree, deer which might rub bark off the trunk, or fungi, which might attach themselves to the tree. Abiotic sources include lightning, vehicles impacts, and construction activities. Construction activities can involve a number of damage sources, including grade changes that prevent aeration to roots, spills involving toxic chemicals such as cement or petroleum products, or severing of branches or roots. People can damage trees also. Both damage sources can result in trees becoming dangerous, and the term "hazard trees" is commonly used by arborists, and industry groups such as power line operators. Hazard trees are trees which due to disease or other factors are more susceptible to falling during windstorms, or having parts of the tree fall. The process of finding the danger a tree presents is based on a process called the quantified tree risk assessment. Trees are similar to people. Both can take a lot of some types of damage and survive, but even small amounts of certain types of trauma can result in death. Arborists are very aware that established trees will not tolerate any appreciable disturbance of the root system. Even though that is true, most people and construction professionals do not realize how easily a tree can be killed. One reason for confusion about tree damage from construction involves the dormancy of trees during winter. Another factor is that trees may not show symptoms of damage until 24 months or longer after damage has occurred. For that reason, persons who do not know about caring for trees may not link the actual cause with the later damaged effect. Various organizations have long recognized the importance of construction activities that impact tree health. The impacts are important because they can result in monetary losses due to tree damage and resultant remediation or replacement costs, as well as violation of government ordinances or community or subdivision restrictions. The tree has always been a cultural symbol. Common icons are the World tree, for instance Yggdrasil, and the tree of life. The tree is often used to represent nature or the environment itself. A common mistake (wrong thing) is that trees get most of their mass from the ground. In fact, 99% of a tree's mass comes from the air. A Wish Tree (or wishing tree) is a single tree, usually distinguished by species, position or appearance, which is used as an object of wishes and offerings. Such trees are identified as possessing a special religious or spiritual value. By tradition, believers make votive offerings in order to gain from that nature spirit, saint or goddess fulfillment of a wish. Tree worship refers to the tendency of many societies in all of history to worship or otherwise mythologize trees. Trees have played a very important role in many of the world's mythologies and religions, and have been given deep and sacred meanings throughout the ages. Human beings, seeing the growth and death of trees, the elasticity of their branches, the sensitiveness and the annual (every year) decay and revival of their foliage, see them as powerful symbols of growth, decay and resurrection. The most ancient cross-cultural symbolic representation of the universe's construction is the 'world tree'. The tree, with its branches reaching up into the sky, and roots deep into the earth, can be seen to dwell in three worlds - a link between heaven, the earth, and the underworld, uniting above and below. It is also both a feminine symbol, bearing sustenance; and a masculine, phallic symbol - another union. 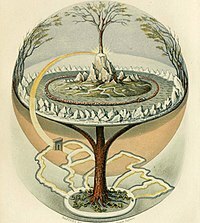 For this reason, many mythologies around the world have the concept of the World tree, a great tree that acts as an Axis mundi, holding up the cosmos, and providing a link between the heavens, earth and underworld. In European mythology the best known example is the tree Yggdrasil from Norse mythology. The world tree is also an important part of Mesoamerican mythologies, where it represents the four cardinal directions (north, south, east, and west). The concept of the world tree is also closely linked to the motif of the Tree of life. In literature, a mythology was notably developed by J.R.R. Tolkien, his Two Trees of Valinor playing a central role in his 1964 Tree and Leaf. William Butler Yeats describes a "holy tree" in his poem The Two Trees (1893). Wattezia is the earliest tree in the fossil record. ↑ 1.0 1.1 "Mangrove Trees". Naturia.per.sg. ↑ Mirov, N.T. 1967. The genus Pinus. Ronald Press. ↑ "TreeBOL project". Retrieved 2008-07-11. ↑ Friis, Ib, and Henrik Balslev. 2005. Plant diversity and complexity patterns: local, regional, and global dimensions : proceedings of an international symposium held at the Royal Danish Academy of Sciences and Letters in Copenhagen, Denmark, 25–28 May 2003. Biologiske skrifter, 55. Copenhagen: Royal Danish Academy of Sciences and Letters. pp 57-59. ↑ "Sequoia sempervirens". Gymnosperm Database. Retrieved 2007-06-10. ↑ "List of Champion Trees published for comment, 2005, South African Department of Water Affairs and Forestry". Retrieved 2010-01-18. ↑ White J. 1990. Estimating the age of large and veteran trees in Britain. Forestry Commission Edinburgh. ↑ 9.0 9.1 9.2 9.3 Gymnosperm Database: How old is that tree?. Retrieved on 2008-04-17. ↑ "Benefits of Tree Climbing". ↑ Wiseman, P. Eric 2008. Integrated pest management tactics. Continuing Education Unit, International Arboricultural Society 17. ↑ 20.0 20.1 Mountfort, Paul Rhys (2003). Nordic runes: understanding, casting, and interpreting the ancient Viking oracle. Inner Traditions / Bear & Company. p. 279. ISBN 978-0-89281-093-2. Wikimedia Commons has media related to Trees. This page was last changed on 22 April 2019, at 06:55.